New Delhi: A Central government panel that recently recommended that there was no need to bring MGNREGA wages on a par with minimum wages, has listed as one of its reasons the gender disparity in actual payment of minimum wages. In its report, the Ministry of Rural Development panel said that not a single state has been able to enforce the payment of full minimum agricultural wages to its women workers — pointing out that the national average shows women get only 78 per cent of the minimum wages paid to men. The Indian Express had reported how the ministry panel, in its report to minister Narendra Tomar recently, said that MGNREGA wages were lower than minimum wages in 17 states but ruled that ‘’there is no compelling argument for convergence of minimum wages for agricultural labour and wages notified for NREGA workers”. Under the Minimum Wages Act, 1948, minimum wages are fixed by states for their agricultural workers, while the Centre notifies the MGNREGA wages. The two were last aligned in 2009, and now there is a wide divergence, with the report blaming it on states arbitrarily increasing their minimum wages. Citing Labour Bureau figures, the report points out that despite state governments mandating a certain minimum wage, women agricultural workers are paid far less than their men counterparts. It goes on to argue that the wages under the MGNREGA “are enforced and enforceable and no discrimination exists between male and female worker wage rate as opposed to the market reality of agricultural wages where wage rates for female workers at all India level were 78% of the male workers”. The report gives the examples of states such as Tamil Nadu, where women earn just over half of male workers, and Karnataka and Kerala, where they get 65 per cent and 73 per cent of the male workers’ wages respectively. A table in the report shows the situation is similar in Maharashtra (65 per cent of wages paid to men) and Andhra Pradesh (73 per cent). States such as West Bengal, Odisha, Uttar Pradesh, Punjab, Bihar, Himachal Pradesh and Assam fare better, but the ratio of women to men wages is only marginally higher than the national average. Officials said that the MGNREGA, which promises 100 days of wage employment to manual casual labour, has seen a steady increase in women workforce, from 40 per cent 10 years ago. 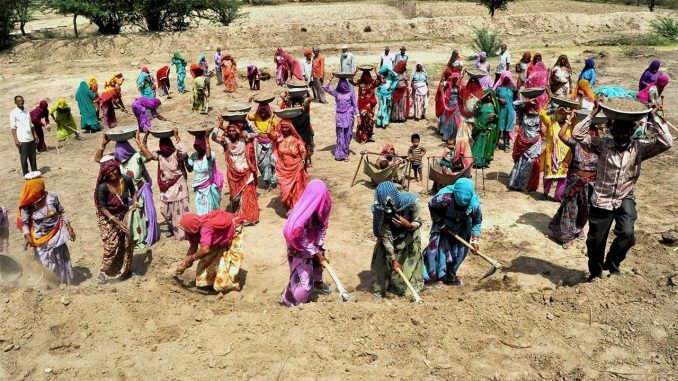 “Today, women account for 56 per cent of the MGNREGA workers. Unlike minimum wages, under MGNREGA, equal wages are paid to both men and women,” pointed out the official. Ankita Aggarwal, who works in Jharkhand as part of the NREGA Sangharsh Morcha, said women agricultural labourers being paid far less couldn’t be a logic used to deny minimum wages. “The fact that under the MGNREGA, both men and women are paid the same pittance is not a justification for non-payment of minimum wages. Since the MGNREGA is a statutory employment guarantee scheme, it is all the more important that it should be a viable option for economic security of rural labour. The government knows that it cannot do away with the MGNREGA, which is why it is finding ways to undermine the programme,” she said. The Ministry of Rural Development panel estimates an additional requirement of Rs 4,500 crore if the wages are brought on a par with minimum wages in the 17 states where they are lower. In 2014, the expert Mahendra Dev panel had asked for parity in MGNREGA and minimum wages. After the Finance Ministry had rejected the report citing fiscal constraints, the Rural Development Ministry set up another panel to study the “financial implications” of the Mahendra Dev report. Development economist Jean Dreze criticised the ministry report for suggesting that the MGNREGA wages should not only be delinked from minimum wages but also held constant in real terms, indexing them to the price level, on the grounds that such an indexation is “scientific”. Dreze told The Indian Express, “It seems to make that case not only for the NREGA wages but also for agricultural wages.